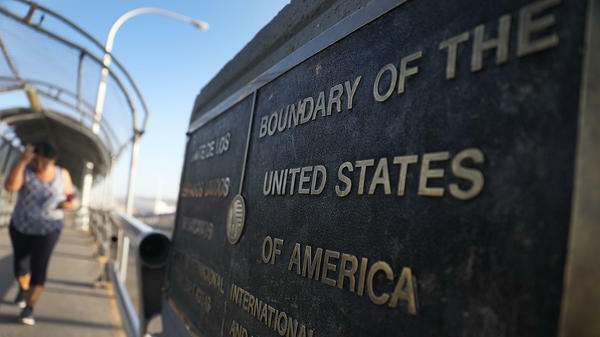 A plaque marks the U.S. border on the Paso Del Norte Port of Entry bridge which connects the U.S. and Mexico on July 23, 2018. As many as 2,551 migrant children ages 5 to 17 were separated from their families after they crossed into the U.S. from Mexico along the border. The federal judge who ordered the reunification of thousands of migrant families says the Trump administration deserves "great credit" for its efforts. But Judge Dana Sabraw also faulted the administration for "losing" hundreds of parents, leaving a significant number of families separated a day after the court-imposed deadline to reunite them. At a status conference Friday afternoon in San Diego, Sabraw said the priority now must be the hundreds of families that could not be reunited — including more than 400 children who are still in government custody because their parents were deported without them, likely to Central America. "It's as if the government wants applause for cleaning up its own mess" without cleaning it up completely, said Lee Gelernt, an attorney with the American Civil Liberties Union, which brought the lawsuit challenging the family separation policy. The Trump administration said it reunified more than 1,400 children with their parents, and hundreds more with sponsors or family members, by the deadline. Now the administration is pushing to quickly deport many of those same families. The ACLU is asking the judge for a one-week waiting period for parents to weigh their legal options before being deported. Lawyers for the government counter that 48 hours' notice should be enough. Judge Sabraw said he would rule on that question soon. And he laid out plans to stay involved in the reunification process, with weekly status reports and status conferences going forward. In a separate hearing in Los Angeles, a federal judge said she'll appoint an independent monitor to look into reports of neglect and abuse of children at facilities along the U.S.-Mexico border. The decision comes after immigration lawyers argued that the Trump administration has been holding children and their parents in inhumane conditions. The government denied the allegations, and opposed the appointment of a monitor. In a hearing on Friday, Judge Dolly Gee said she reached her decision after seeing a "disconnect" between government monitors' assessment of conditions in facilities in the Rio Grande Valley, and the accounts of more than 200 immigrant children and their parents detailing numerous problems, including spoiled food and foul-smelling water. After the hearing, attorney Peter Schey of The Center for Human Rights and Constitutional Law said the problems are pervasive in facilities all along the Southwest border. "This includes inadequate food. It includes enforced dehydration. It includes sleep deprivation because children do not have mats to sleep on or blankets," Schey said. "It includes unsanitary conditions because children do not have soap. They do not have towels. They do not have access to basic toiletries." Judge Gee oversees the Flores settlement, a 1997 settlement agreement that says the government has to release migrant children from custody to a relative, sponsor or a facility licensed to care for children within 72 hours. The parties have until Aug. 10 to agree on a proposed monitor. If they can't, each side will make suggestions to Judge Gee, and she will choose one. For the next few minutes, we're going to be talking about some of the ongoing issues at the U.S.-Mexico border. A court-imposed deadline to reunite families separated at the border has come and gone. Yesterday, the federal judge in San Diego who set that original deadline held a hearing where he commended the administration for reuniting more than 1,800 migrant children with their parents. But he also said attention must now turn to the hundreds who are still separated. Another hearing yesterday in Los Angeles addressed concerns about the treatment of those children. A federal judge there said she would appoint an independent monitor to look into reports of neglect and abuse of children at the detention facilities along the U.S.-Mexico border. Julie Small is a criminal justice and immigration reporter from member station KQED. She attended that hearing, and she's with us now from Los Angeles. Julie, welcome. JULIE SMALL, BYLINE: Glad to be here, Michel. MARTIN: Tell us more about what happened in the hearing yesterday, if you would. SMALL: Well, U.S. District Judge Dolly Gee said she wanted to appoint an independent monitor to ensure that migrant children are treated humanely. She's in charge of this decades-old settlement that sets strict limits on how long the government can detain children and what kind of conditions. And she said she needs someone to be her eyes and ears at immigration and Border Patrol facilities because she can't be everywhere at once. And we're hearing reports that things are getting worse. MARTIN: Well, tell us more about what the advocates for children are saying. SMALL: Well, they're finding that children - they're being served spoiled food, frozen sandwiches, water that is foul-smelling or water that they drank and then got ill. There are not enough mattresses to go around, so they're having to sleep on the floor. And there are even reports that they're being verbally abused. The other thing that's happening is, you know, under this settlement, children have rights. They're not supposed to be held in these restrictive environments for longer than 72 hours, but they are ending up in these Border Patrol facilities for much longer than that. MARTIN: How did the government respond? SMALL: Well, they say that they'd like to present evidence, before any monitor is appointed, to refute these claims. And they feel that they are doing a good job and they are adhering to the settlement. And they feel that it's not necessary to have this extra layer of oversight. MARTIN: Did they specifically respond to the things that you cited, that the advocates are citing about the quality of the food and the water and just overall unsanitary conditions? Did they have any specific response to that? SMALL: No, they didn't. They just said that they had their own reports. They had some data that would refute it, and the judge's responses to that was, well, we've had some problems with the government's record keeping. So how does that help me? She wants to go ahead and establish a monitor, and she said the government can come back later if they want and present their own evidence. But she's going to move forward with getting someone in place to have more oversight. MARTIN: There was another hearing yesterday about the deadline to reunite separated children from their parents. Apparently, the government has made some strides in restoring some of these families. But apparently, there are still hundreds of kids who are still separated from their families. Can you tell us any more about that? SMALL: Well, one of the alarming things is that there's about 400 of those children whose parents are no longer in the country. And there's questions about, you know, whether they were deported or left on their own. There is no plan yet in place to reunite those children with their parents. And also, a subset of that group, the government is saying, about 120 parents waived their rights to be reunified with their children. The attorneys for the ACLU who are representing the families say, well, that's not what they're hearing. They're hearing that parents had no idea what they were being asked to sign. They were given a piece of paper, and they were told to sign it within five minutes. And it wasn't really explained to them. So they may have actually signed something but really had wanted to be reunited with their children. And again, that's a mess that needs to be untangled still. MARTIN: That's KQED's Julie Small. Julie, thank you. SMALL: Thank you. Transcript provided by NPR, Copyright NPR.